Coastal waters of the northern portion of the California Current System experience a seasonal decline in oxygen concentrations and increasing hypoxia (dead zones) over the summer upwelling season resulting in negative impacts to many organisms. NCCOS-sponsored research modelling determined that planktonrespiration was the leading influence on seasonalandinterannual fluctuations in oxygen concentration and hypoxia in the Pacific Northwest (PNW). The coastal ocean of Washington and Oregon is an eastern boundary current upwelling region that experiences a seasonal decline in oxygen on the continental shelf. Over the course of the upwelling season (usually May -October), persistent northerly alongshore winds cause nutrient-rich, low-oxygen deep water to rise (upwell) onto the shelf. The PNW coast is one of the most productive fishing areas in the U.S. due to the upwelled nutrient-rich bottom water. Oceanographers have long known upwelling regions frequently experience hypoxia and associated negative impacts (e.g., mass mortality) on invertebrates or fish living on or near the bottom. However, in the PNW researchers have disagreed as to the primary cause of the hypoxia; physical (i.e., ocean circulation) or biologically-driven (i.e., oxygen consuming respiration by abundant phytoplankton and zooplankton). In examining the origins and causes of harmful algal blooms in the PNW, scientistsdeveloped a high-resolution model of the region that determines the relative roles of ocean circulation and local respiration of organic matter with regards to theseasonal oxygen decline on the shelf. Model results show respiration primarily controls (50-60%) seasonal oxygen loss on the PNW shelf and the spatial variability of respiration controls the spatial variability of hypoxia on the shelf. 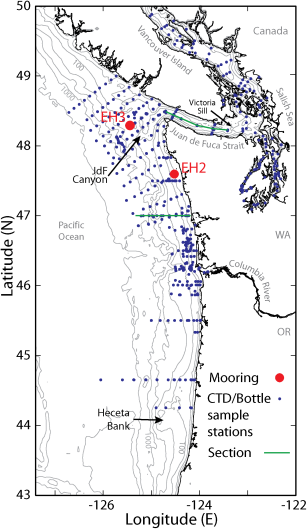 This finding highlights the importance of nutrients and associated respiration in the water column and sediments in creating dead zones along the PNW coast. The results, part of the NCCOS Ecology and Oceanography of Harmful Algal Blooms project ‘PNWTOX,’ werepublished back in December in the Journal of Geophysical Research: Oceans. For more information, contach Quay.Dortch@noaa.gov.